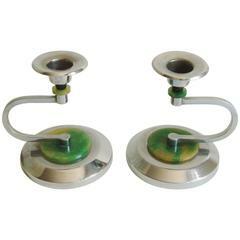 This fun and rare pare of English Art Deco chrome-plated candlesticks are both accented with a green/yellow marbled Bakelite disk at the base and black Bakelite spheres beneath each conical bobeche. 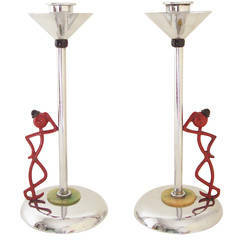 Seated on each base and leaning on the chrome shaft is a bronze, obviously inebriated stick figure holding a bottle aloft the design of which has been attributed to Hagenauer. These were manufactured by GEC and impressed to each base is the English design registration Number 820613 dating them to 1937. The inspiration for the design comes from the popular song of the time, Show Me The Way To Go Home. This song was originally written in England in 1925 by James Campbell and Reg Connelly but went on to become a perennial favorite on both sides of the Atlantic in the years to follow. The pair are in excellent condition with only slight fading to the green/yellow Bakelite and a wonderful patina to the bronze inebriates. This is a rare and amusing pair in great condition.